Digg Mark 1's Official Blog: Challenge 17: Really Greg, that was uncool, quit taking my challengs! Challenge 17: Really Greg, that was uncool, quit taking my challengs! This weeks challenge is for rlax. 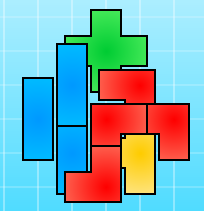 The goal in rlax is to clear the pieces that are on top of each other, until you have the board cleared. You get points by NOT making errors, and completing it as fast as you can. Also, there are achievements for rlax on Nonoba, if anyone has an account there. rlax also has a good rating on kongregate (3.67) so badges aren't out of the question. The challenge is for highscore, good luck!